This year's models are a "refreshing, positive step forward for the iPad," Wired wrote, adding that they "put other tablets to shame." Focusing on the possibility of using a Pro as a laptop replacement however, the magazine argued that people will need "the right kind of occupation, and a lot of patience and determination," since iOS multitasking isn't on par with a Mac or Windows machine, and some apps and websites are limited on the device, though the latter is as much a matter of developer support. TechCrunch called the Pro "an excellent tablet," but said that it "really shines" when paired with the second-generation Apple Pencil and a keyboard. The double-tap gesture on the new Pencil could potentially make it the "mouse for the tablet generation," the site remarked, becoming "the key to unlocking an interface that somehow blends the specificity of mouse-driven computing with the gestural and fluidity of touch-driven interfaces." A recurring theme in reviews is the cost of a Pro, which is higher this year at a minimum of $799. CNET for example was positive on the tablets' use of Face ID, "all-screen design," and "scary-fast performance," but commented that the Apple Pencil and Smart Keyboard Folio are effectively mandatory add-ons that "jack up the already-high total price." The issue is potentially compounded by the switch from Lightning to USB-C and the removal of a headphone jack, since existing iPad owners may need to replace other accessories too. Mashable called the new Pros "beautiful slabs of glass," and "more powerful than any iOS device or competing tablets." Going further the site enthused about the "physical closeness with digital content creation," describing it as a "paradigm shift from mouse and keyboard." "It's such an intimate creation process that it made me realize that Apple's not merely trying to change my or your old habits," the site elaborated. "Apple's not trying to make the iPad Pro a laptop replacement because the device isn't one. It's trying to do something bigger: invent a new way of creating for a new generation that is not bound to the old computing laws of clicking a mouse." Nevertheless, it said that "iOS on an iPad still isn't as robust for general work as a MacBook running macOS." A common complaint is that iOS still lacks an open filesystem, which would make it easier to manage data and allow customization. Apple has kept iOS locked down on both iPhones and iPads in order to control the user experience and deter hacking. The Verge's conclusion summarized many reviews. "Is the new iPad Pro a stunning engineering achievement? Without question," the site wrote. "Has Apple once again produced mobile hardware that puts the rest of the industry to shame when it comes to performance, battery life, and design? Yep. 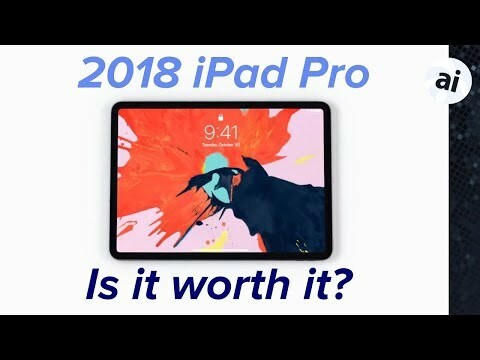 Is the iPad Pro the best, most capable iPad ever made? It certainly is. But you know what? It's still an iPad." I've gotten original iPads for the grandkids and an iPad Air 2 for my wife over the years...they love them. I bought the latest iPad Pro 2018 for myself because I wanted the very best iPad...period. For me it's not meant to be a laptop replacement...I have an iMac. The Verge complained: “iPad app ecosystem underdeveloped and feature-limited”. Hilarious. Especially when he was given a pre-release version of Photoshop to try. I wonder, if iOS tablet Apps/ecosystem are “limited” then how would you describe Android, which is a complete joke? Or using a Surface in tablet mode without any optimized software? What is his point of reference to make this claim? "since iOS multitasking isn't on par with a Mac or Windows machine, and some apps and websites are limited on the device, though the latter is as much a matter of developer support." I wonder how many people actually use multi-tasking on any computing device. Yes, they bounce back and forth between social apps, email, and messaging but that's usually it. (disclaimer: I know most people on this forum are advanced users but we're in the minority) As for apps and (especially) websites, this isn't a limitation of an iPad, or any iOS device, it's a limitation of the website designer. I continue to have issues accessing some websites (probably Windows-centric servers) even on my iMac. If the website designer is skilled with providing access to everyone, then I have no problems. As legitimate tablets become more available (Apple already has them but others are still glorified, cheap phones) my hope is website designers and app programmers will expand the capabilities of their products. I don't like Adobe as a company (anymore) but their announcement of a full version of Photoshop for the iPad in 2019 shows some companies are beginning to treat the iPad as a "real" device, which we already knew it was. I (finally) purchased a home version of Office 365 so my daughter could upgrade to Mojave (on a newer Mac). I don't really want Microsoft software on my iOS devices but I will give it a try to see how it compares to Office on my Mac. Add all the existing iOS apps that already work great on the iPad and I might just get an iPad Pro to replace my outdated MBP for travel use. btw: read the fine print on Microsoft's website about Office support on iOS devices. "iOS: Office for iPad® and iPhone® requires iOS 11.0 or later. Office for iPad Pro™ requires iOS 11.0 or later. Office is supported on the two most recent versions of iOS. When a new version of iOS is released, Office’s Operating System requirement becomes the then-current two most recent versions: the new version of iOS and the previous version." If you compare to notebooks as Tim has done, iOS has still its limitations. No multi user support, no development tools (XCode, ...), poor file management. Consulting MS Office document on an iPad work fine, but creating big Excel sheets or Word documents on an iPad remains a challenge. Looking forward to receiving my LTE version (Wednesday?) this week. However, I do think it's completely messed up that Apple provided ALL the reviewers mentioned a 1TB version of the tablet that has 6GB of RAM, that won't be what most of us are using. It seems a little odd to identify these reviews only by the name of the site where they appeared, rather than naming the individual reviewers — since point-of-view and credibility do make a difference, and most AppleInsider regulars will probably recognize the names. This curious elision is especially awkward in the case of Nilay Patel's review for The Verge — "the site wrote" is all we are told. But Patel is a heavy-hitter, on a par with Walt Mossberg in the Jobs era, and certainly no enemy of Apple, as evidenced by his glowing reviews of the new iPhones. I imagine Tim Cook does not think of him as "the site." That quibble aside, thanks for the informative sampling! All these reviews seem to be laptop minus rather than tablet plus. I’m waiting for Federico Vittici’s review. He’s someone whose primary computing device is iPad. He was at the event last week. Why Apple didn’t give him a review unit boggles the mind. His review means way more than Nilay Patel’s. Has it been confirmed that only the 1TB models get 6GB RAM? If so it would be nice to know if the difference is noticeable. I agree, and that's my problem with the reviews. I'm getting the pro for light work and as a replacement for an old iPad Air, but they aren't cheap and it would have been nice to know before I ordered one that it was vaguely future-proofed. Nilay Patel is a jackass. Those remain a challenge on a laptop too, unless you attach an external monitor. The same for Xcode, if you code 12 hrs a day you need a large monitor. Of a trio of desktop, laptop, iPad it is the laptop which presents the much compromises. It is time to question the very notion of “laptop”. Jobs clearly saw the iPad as the future of computing. It was the product he had spent his entire career working toward. His generation had dreamed of something like it for nearly 30 years. He would have been far more aggressive than post-Steve Apple has been in addressing the factors that are holding it back, such as an awkward file system and lack of a pointing device. These limitations are compounded now by higher prices. Jobs would have done whatever was necessary to have the iPad become the computing device of choice by now—both for consumption and for productivity. As it is, it is now mostly relegated to a pricey consumption device. iOS needs to become a real operating system and let you run real apps. It needs a real file system as well. For pro users, including developers, it needs a pro mode that allows users to do whatever they want to like they can on a real laptop computer even if it means accepting some risk. iOS should be able to run Xcode. It has plenty of CPU power and RAM. The only reason it can't is a software limitation imposed by iOS. You should be able to have apps that can scan and connect to a WiFi router, be able to see real MAC addresses, fully access Bluetooth without restrictions, run in the background or with the screen locked even if that means they can drain the battery. Pro users should be able to side-load apps. By all means ask for permission and use entitlements but allow the iPad to finally become a real computer. Mr. Cook, tear down this walled garden! Who uses a mouse anymore? Yech! And I am still going to buy iPad Pro. I have first generation iPad Pro and it's time. Because he doesn't agree with you? I appreciated his review -- all of the reviews actually. I like looking at differing viewpoints, not just ones that align with my views. I'm actually trying to decide between replacing my Apple Watch Series 2 Stainless Steel with an Apple Watch Series 4 Stainless Steel or getting an 11-inch iPad Pro 64GB (I have $750 in Best Buy gift cards that I cashed in from my CC rewards). The Series 4 would be a big upgrade for me speed wise over my Series 2 and I love the display, but at the end of the day this would be a "want" versus a need. I still mainly just use my Apple Watch for notifications and not much else, so $700 is kind of silly when I can just potentially wait and get it secondhand. The iPad Pro, however, is starting to sound like a more promising purchase. I don't currently have a personal iPad (my kids share a 2018 9.7-inch iPad 32GB), and it could serve as a more portable alternative to my 15-inch MacBook Pro. So knowing the limitations and pluses and getting input from all sides is great to read. You’re on the wrong line, dude, go to the correct one. Wut? Most of the things holding iPad back came from Jobs. He specifically placed the iPad as an in between device. What happened though is the larger smartphone came along. But if you go back and watch his presentation what was magical about iPad was it was just this piece of glass that you manipulated with your fingers. The future of computing isn’t turning iPad into a laptop. Not everyone, but most people do. Not having mouse support is an artificial barrier imposed by Apple to prevent iPad sales cannibalising low end macbook sales.